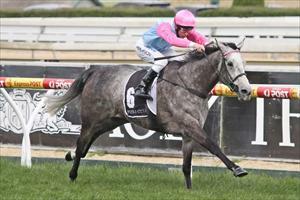 Quality mare Platinum Passion was back to her best with a gutsy victory at Caulfield on Saturday, the five-year-old always travelling well for Kerrin McEvoy who was having his first race ride on the grey. Always well regarded by the stable, Platinum Passion was third up over 2000m and Michael Moroney is confident that the best is still to come. “It would be nice to win a black type race with a royally bred mare like her,” he added – noting that the daughter of champion stallion Redoute’s Choice is a granddaughter of the champion mare Horlicks whose son Brew won Ballymore the Melbourne Cup. Already stakes placed on three occasions, Platinum Passion A $300,000 is an Easter sale graduate selected by Paul Moroney and raced by the Consolidated Bloodstock Ltd Syndicate. In other stable news Glass Harmonium worked nicely at Moonee Valley on Monday morning. Wearing pacifiers with Kerrin McEvoy in the saddle, the import was, according to Moroney "nice and relaxed in his work - in fact I was surprised with how relaxed he was." "For his first time around the Valley I thought he went really well." The Turnbull Stakes is next on the agenda for Glass Harmonium, after which a decision will be made regarding the W.S Cox Plate or the Caulfield Cup.